Recognizing that Conflict Manager has an eclectic readership from many countries and with many interests, a book on the legalities of self-defense focused on firearms and specific to United States law may have limited appeal. That said, most of the board members of CRGI know each other through the personal protection community and self defense is a subject that has touched all of our lives. Also, The Law of Self Defense is a good and important book. That’s the most salient thing. If you have anything to do with self-defense, either as a student or an instructor, the legalities are important. I’d go so far as to say it is negligent to teach self-defense in any form without a solid grounding in force law. Let’s dispense with something right away. The old saw, “I’d rather be tried by twelve than carried by six.” For those unfamiliar it means, “I’d rather go on trial than be killed.” In logic, this is what’s called a “False sort.” How about surviving AND not going to prison? Embrace the power of and. There are also a few who will argue that thinking of legalities in a deadly force situation will paralyze you. I disagree. Every thinking person knows that there will likely be legal consequences after a violent encounter. It is my experience that, when a problem is known to exist, ignorance creates a deadlier freeze than knowledge. The Law of Self-Defense takes an intimidating subject, one that has a long history, with sources written in obscure legal language, and nuanced over many jurisdictions and makes it accessible. Practical. It was actually kind of fun to read. And I never got the feeling it was dumbed down. The chapters take important concepts like, “What is innocence?” and breaks the concept down into common sense language. And gives actual incidents. And quotes relevant case law. At the end of almost every chapter, there are tables that give the exact wording for the specific aspects of law discussed in the chapter for all fifty states. 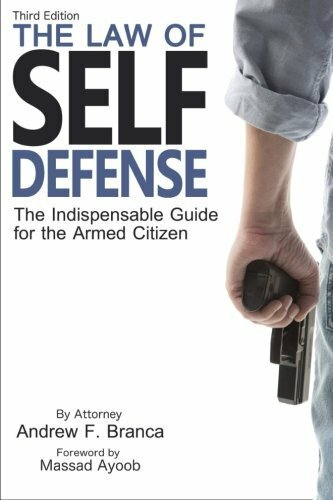 Well written and concise overviews combined with stories and combined with technical details makes a powerful and simultaneously easy to grasp tome that should be on the required reading list for self-defense instructors, students and anyone who carries a weapon. Branca gives the legal details of a perfect world, but also gives the gritty details of how the cases sometimes go. It’s not always pretty, and that should keep you cautious. Caution is usually a good thing. Read the book. For an understanding of the legal principles, for an understanding of the legal process (from arrest to booking to trial and the civil side as well) and for the keys to planning a legal strategy well in advance, read the book. If you intend to teach self-defense and want to answer your student’s questions, I don’t know of anything better available. Editors note. This review pertains to the second edition published in 2013. The third edition is now available.